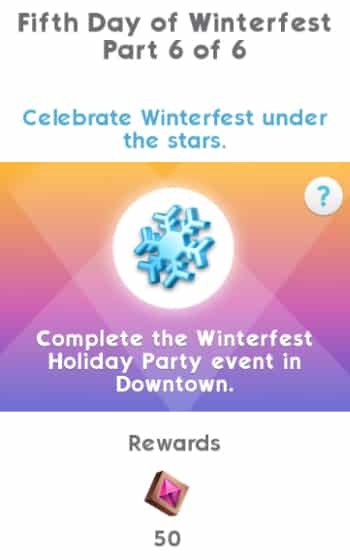 The Sims Mobile Team sent us exclusive information about their upcoming 12 Days of Winterfest Event! 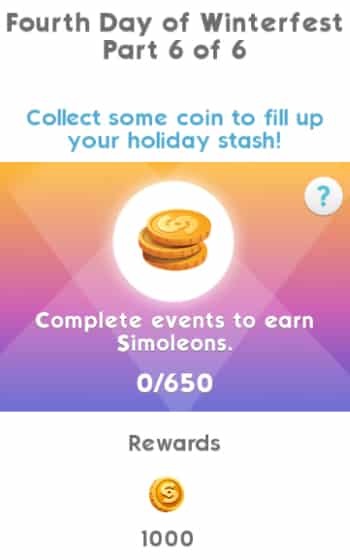 Just like the ASOS Fashion and Halloween Events this one has a similar progress user interface with an option for you to claim tokens through quests and spent those tokens on the items of your choice. 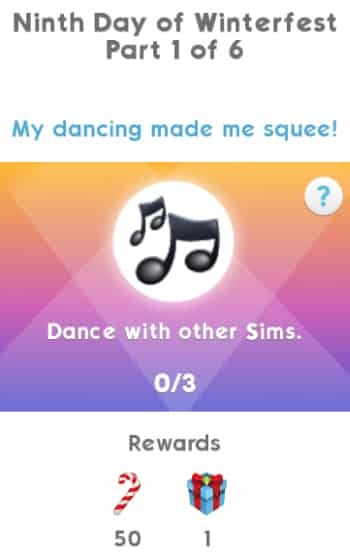 There’s a huge variety of quests available in the game as well as prizes that you’ll be able to purchase for your Sims and your home. In this article I’ll be taking you through all the quest steps and items that you’ll be able to unlock with this event. 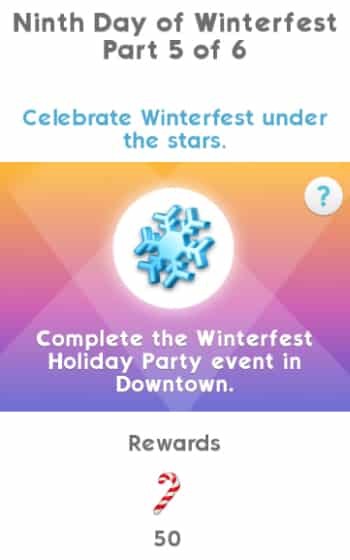 Down below you can check out the video walkthrough of the latest 12 Days of Winterfest Quest. 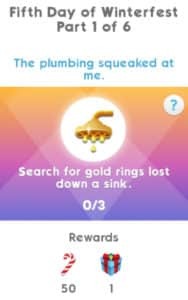 If you prefer written content keep scrolling! 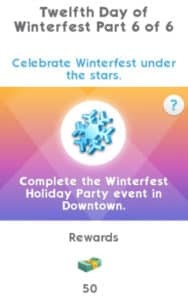 The 12 Days of Winterfest Event menu comes with a lot of useful options, overviews, quests and activities that you can watch over and achieve during the event. 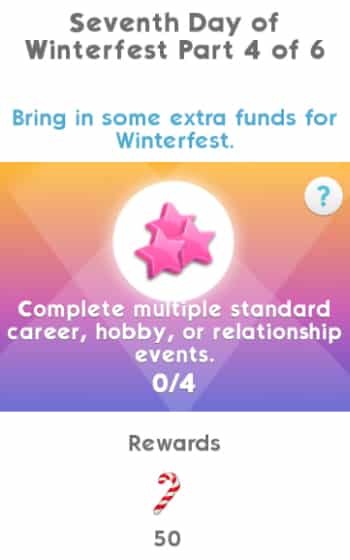 As you might’ve guessed, this event is going to last for 12 days as soon as the Welcoming Winterfest Head Start Quest comes to an end. The items that you’ve earned from this quest will definitely come in handy and will give you some extra Candy Canes (the new token that comes with this event) on a regular basis. 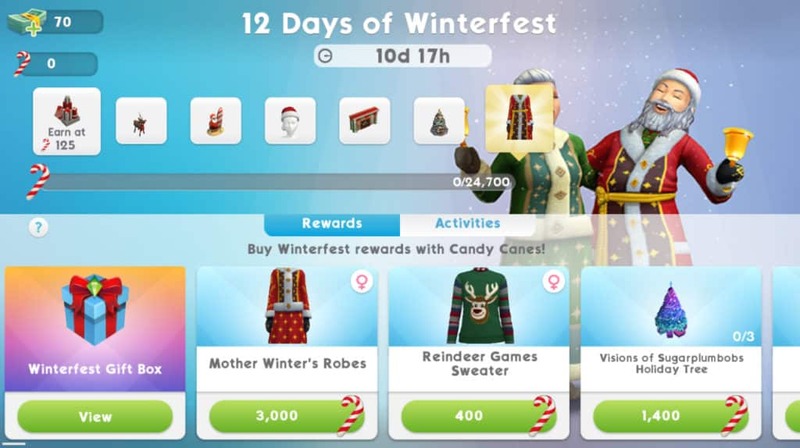 Down below you can see that the 12 Days of Winterfest Event Menu includes a progress bar with items that you’ll be able to unlock as you collect Candy Canes through various activities and quests. The progress bar will count all the Candy Canes you’ve collected through the event and will not subtract and tokens if you decide to buy reward items in the reward section. 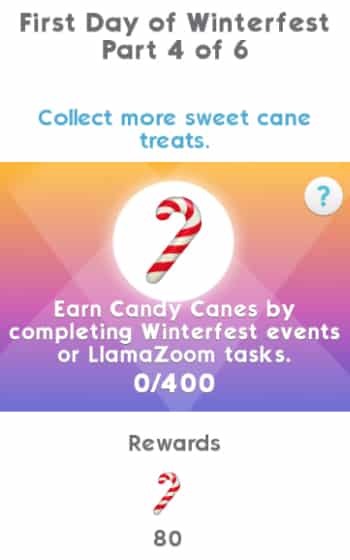 Below the progress bar you have 2 sections: Rewards and Activities. 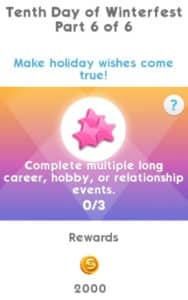 Rewards are items that you can purchase in exchange for Candy Canes. 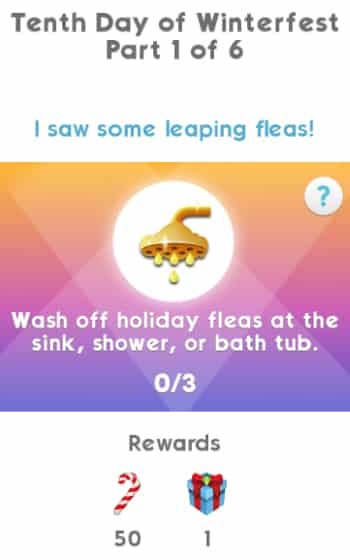 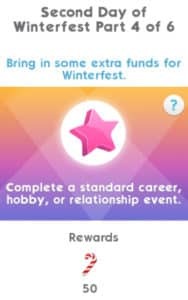 There are plenty of exclusive rewards for this event and we’ve already have them covered in this article (slightly down below). Activities are events that you can do, usually on a daily basis, that will reward you with Simoleons, XP points and of course – Candy Canes. 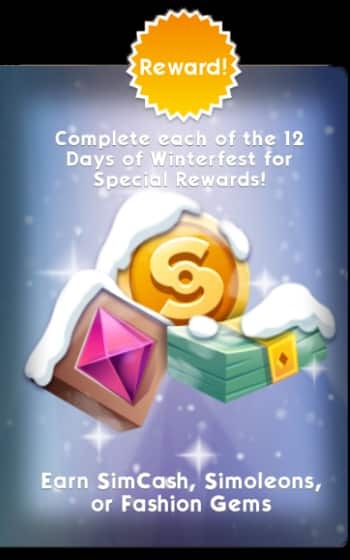 There are 30 reward items that you’ll be able to unlock through the Rewards section in the 12 Days of Winterfest Menu. Each reward item can be purchased exclusively with Candy Canes. The items that you’ve seen above aren’t the only new items that you’ll be able to purchase in exchange for Candy Canes. In the beginning of the Rewards section you have the “Winterfest Gift Box” with 20 unique items. Unlike with the items in the reward section that you get to pick and choose in return for Candy Canes, here you’re purchasing a Gift Box for 25 Candy Canes in return for a random item that’ll be selected from the catalog down below. 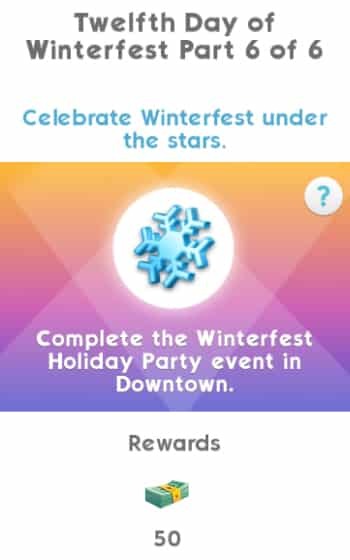 The Sims Mobile’s 12 Days of Winterfest event comes with THE BIGGEST quest! More precisely 12 quests with each quest having 6 steps that you need to complete in order to get the grand reward. Before we get into all of the quest steps that you need to take, here’s a look at the reward that you’ll be getting after completing each quest segment. 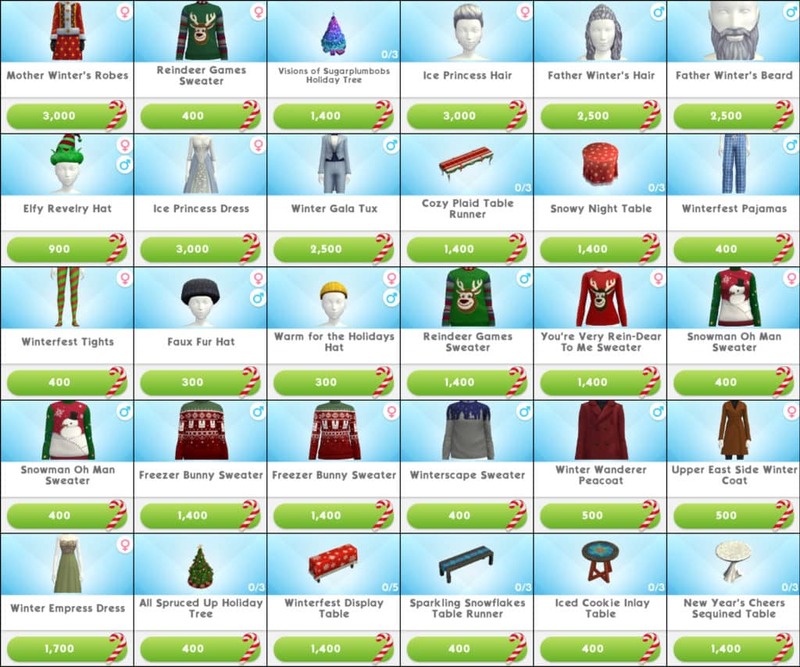 There are 12 seperate quests and each quest gives you the ability to unlock Fashion Gems, Simoleons or SimCash. 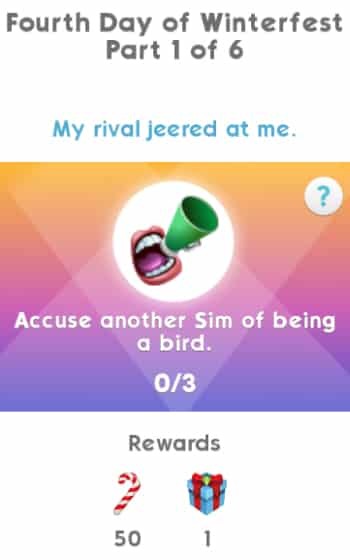 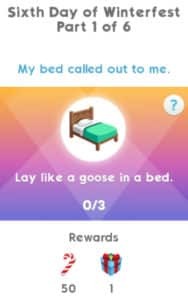 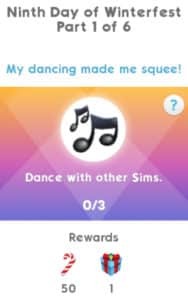 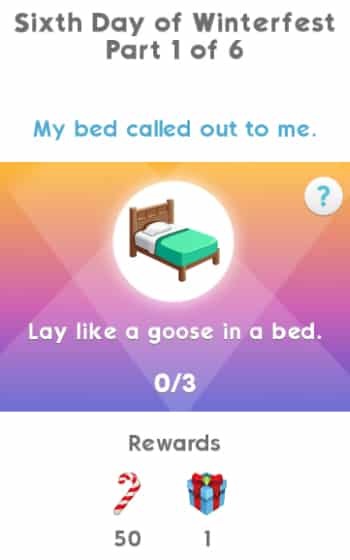 Each quest segment for each day of the quest brings a unique token reward (Fashion Gems, Simoleons or SimCash). The token rewards are not randomized but each prize is set individually for each day of the quest, meaning that the prizes have already been set. 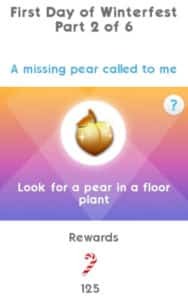 Down below you can check out each day of the quest and each step that you need to take in order to get the prize shown above. Quests below are linked when it comes to progress and completion – meaning that if you want to reach to Day 12 quests you’ll need to complete the first 11 days of quests. If, for example you finish Day 1 of quests you’ll be able to immediately move on and start completing the Day 2 quests. Down below we’ve listed all the quest steps, shown rewards for each step and listed the grand prize that you’ll be getting after completing the 6th step for each Day of Winterfest. 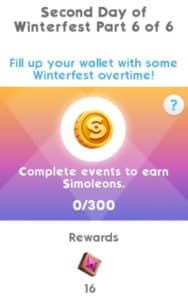 Complete events to earn Simoleons (30 Simoleons). 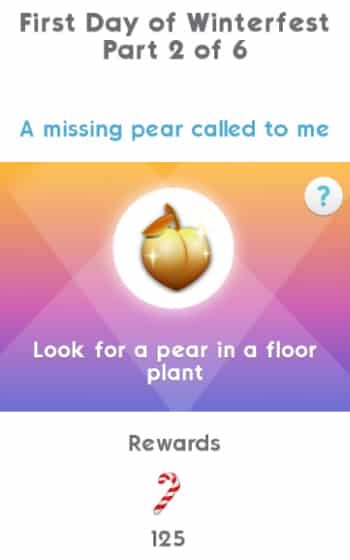 Look for a pear in a floor plant. Complete a short career, hobby, or relationship event. Earn Candy Canes by completing Winterfest events or LlamaZoom tasks (400 Candy Canes). Complete the Search for the Regiftable Gift event at Home. 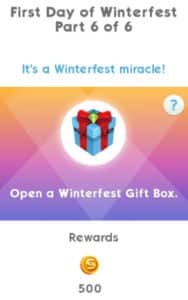 Open a Winterfest Gift Box. Search for crying doves in floor plants and trees. 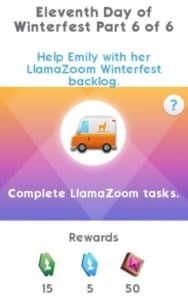 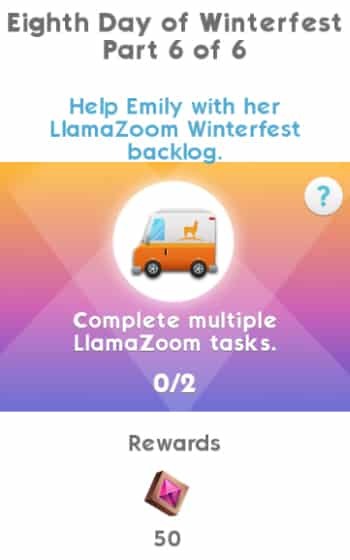 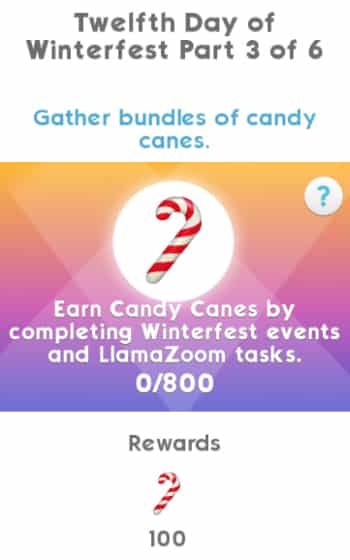 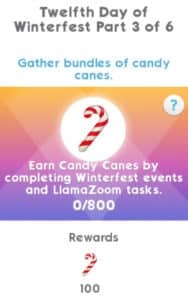 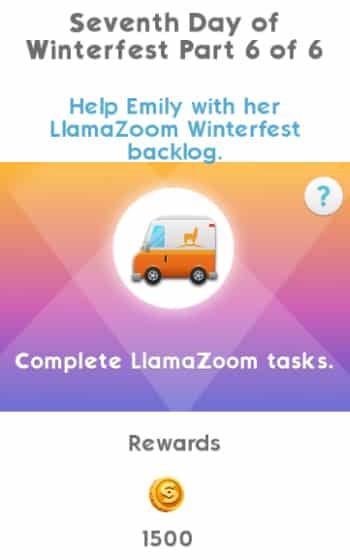 Earn Candy Canes by completing Winterfest events and LlamaZoom tasks. Give out stickers (5 Stickers). Complete a standard career, hobby, or relationship event. Complete the Last Minute Shopping event in Market Square. 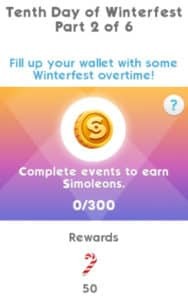 Complete events to earn Simoleons (300 Simoleons). 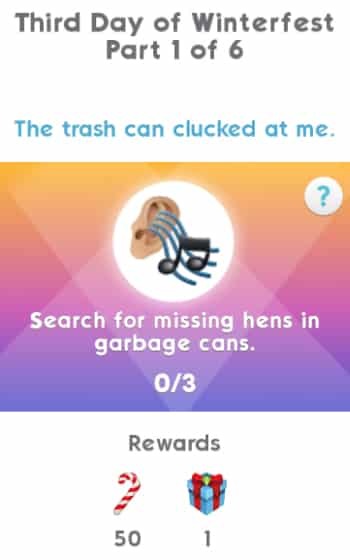 Search for missing hens in garbage cans. Complete the Winter Waterfront Mystery event in Waterfront. Complete the Latte & Skate event in Parkside. Complete the Winterfest Holiday Party event in Downtown. 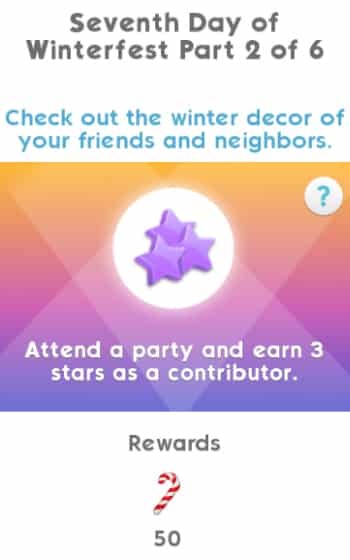 Attend a party and earn 3 stars as a contributor. Complete events to earn Simoleons. (650 Simoleons). Now that’s a holy grail of content right there. Nice work! 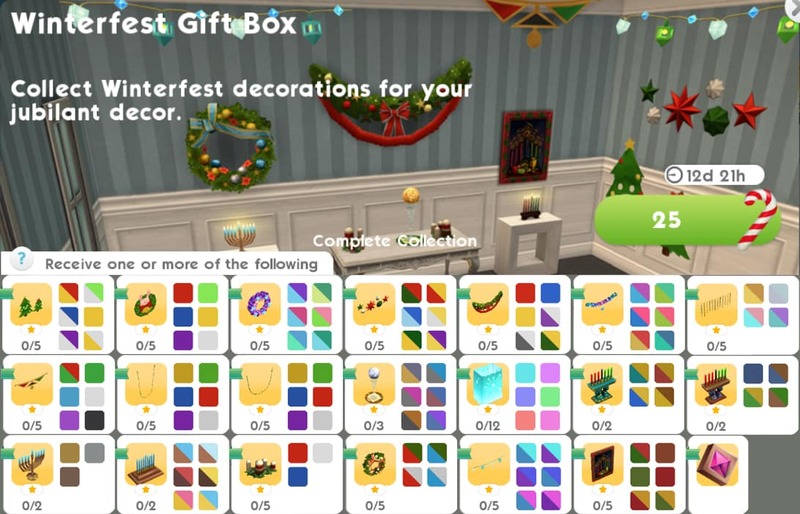 How do the three Nutcrackers ACTUALLY help?? 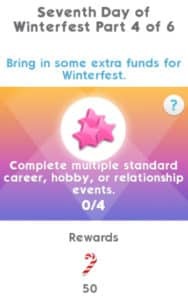 It seems I only use them during WinterFest events and they are just another object I use energy on. 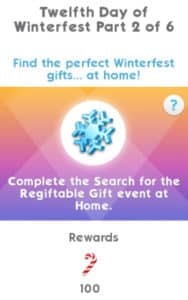 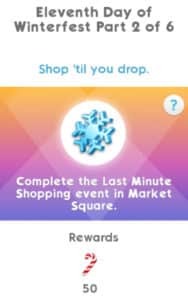 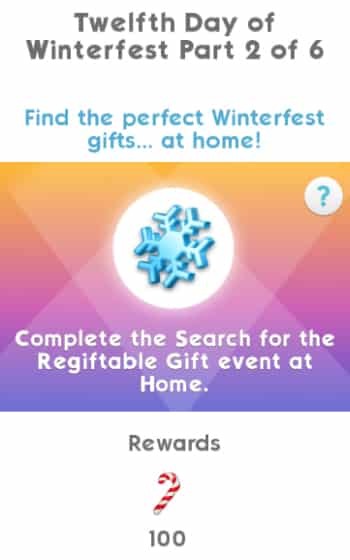 If you complete the Winterfest events out of sequence from the quest, for example, search for the perfect regiftable gift event is also step 5 of the first day, if you’ve already done it before it comes up in the day’s quest, will it count as being done, or do you have to do it again? I couldn’t either but I found some at the medical center. There’s some down by the waterfront. What I don’t understand (has anyone else noticed) is why do they time these holiday quests to end ON the holiday and not before. By the time you’ve earned everything is kinda late to really do anything with it. FYI once you finish the entire quest, in addition to all the prizes for each day, you also get $20 sim cash, 500 simoleons and I think 15 fashion gems.